In May of 2008 it was announced that Cuban artist Wilfredo Prieto had won the Cartier Award, which is acknowledged as one of the world's leading art awards. Prieto's winning installation was realized at the Frieze Art Fair in London, October 16th - 19th, 2008. Curator Neville Wakefield comments: “Wilfredo Prieto stands out amongst his peers for creating art that levitates the ordinary. With great economy of means he addresses issues of sculptural and geo-political accumulation in ways that are at once provocative, charming and poetic.” He was awarded $10,000 to complete the project. In September of 2008 I proposed the work that became Agit: Prop. 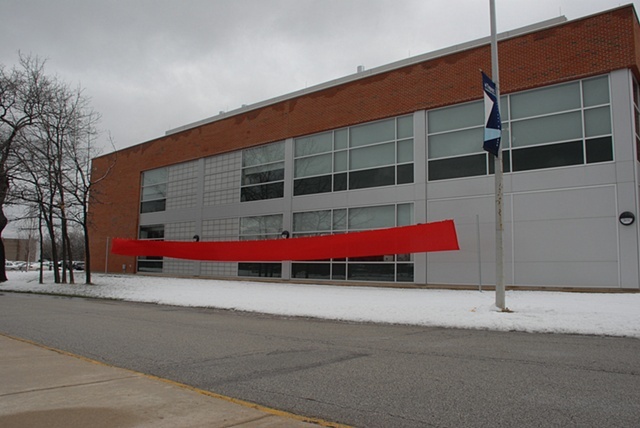 It was installed adjacent to Gallery 400 in Chicago from December 2 - 9, 2008. I spent about $80 on materials. So, what? You might ask. What's the connection? The connection is that they are the EXACT same project, save, perhaps, for the increase in scale that might have taken place had I been give ten-grand to spend on mine. I had no knowledge of his project before conceiving of mine, but there is no getting around it: my ace was trumped. If we were inventors, he would have secured the patent. It's over for me, though I was hoping one day to expand and reinstall the project somewhere. So this is my response. My flag. Agitated. Rinsed. Spun.